The ongoing drought in California means less habitat, fewer ducks and reduced hunting opportunities as a result. This could create a vicious cycle that continues to have an impact on habitat for years to come. Water Deeply discussed it with Mark Hennelly of the California Waterfowl Association. The drought has disrupted bird migration, diminished food sources and may lead to ill health when birds crowd into the limited habitat that remains viable during drought. This is particularly true for ducks, geese and other waterfowl and wading birds, which rely on vast areas of shallow standing water for food and protection. It also disrupts conservation funding, because hunting opportunities are restricted. Hunters, through the fees and taxes they pay on licenses, equipment and land access, fund a lot of the conservation activity that keeps migratory birds healthy and allows the purchase of additional habitat lands. The California Waterfowl Association (CWA) is a duck-hunting organization founded in 1945. Since its inception, the group has been an active partner in conserving California’s wetlands. Mark Hennelly, the group’s vice president of legislative affairs and public policy – and a hunter himself – recently spoke with Water Deeply about what the drought has done to migratory birds and their habitat. Through state and federal government partnerships, working with farmers and other nonprofits, CWA is active in managing water and wetlands for public use. Water Deeply: How is the drought affecting access to hunting areas? Mark Hennelly: It’s having a significant impact. The hunt quotas on our public areas are very limited. The public areas provide not only low-cost recreational opportunities, but a lot of people start their hunting experience there. So in terms of recruiting, it may have an impact over the long term. A lot of our private ducks clubs are having trouble flooding up their areas and that is reducing hunting opportunity on private land. The habitats they’re providing that are on both public and private areas, they don’t just benefit waterfowl and species that are hunted, but a whole host of other non-game species and other wildlife species that are important. It definitely has an impact far beyond just hunting. Water Deeply: What hunting areas are closed because of the drought? Hennelly: Sutter National Wildlife Refuge is currently closed. Kern National Wildlife Refuge is closed as well. The other areas that are up and down the Central Valley that provide the bulk of our hunting activities in California have significantly reduced hunter quotas. Many of them will see only 25 percent of normal hunter capacity on opening day, or maybe as much as 50 percent, but certainly significant reduced opportunities for sportsmen. We have very popular areas like Little Dry Creek Wildlife Area (in Butte County). Normally the hunter quota there would be 25 to 30 reservations. This year it’s five reservations. And that’s probably the most popular area in the entire state. Water Deeply: Are hunters more crowded in lands that remain available? How do quotas and reservations work for hunters? Hennelly: Our fear is it’s going to reduce participation. There are much longer lines at these public hunting areas with people trying to get in. You’ll have folks that will show up very early in the morning, we’re talking 3:30, 4 in the morning and they wait in line, it’s called the sweat line, and in years like this a hunter can wait the entire day and never actually get on the refuge. There are a lot of people, as we call it, kicking a lot of rocks in the parking lot and essentially having to wait a long time just for the opportunity to get on but there’s no guarantee that they will be able to access the refuge. The reservation system is on a lottery system. Seventeen days before the hunting day you can apply for a reservation through (the state’s) electronic system. They do cost money so hunters are putting in hundreds of dollars to apply for the lottery but there’s no guarantee that you’re going to be successfully drawn. The odds of drawing reservations for some of these areas are 50, 60, even a hundred to one. You have to put in a lot of money to maybe get a few reservations out of it. If we get to a point where there’s not enough opportunity in the field, people will definitely give up hunting. One of the biggest reasons people cite in surveys as to why they’re no longer hunters is because of lack of opportunity. So that is our fear: This drought continues and we have very little space to accommodate these hunters and people get frustrated. We’re going to see a lot of hunters leave the sport and that’s going to have a negative impact in funding for conservation. Water Deeply: What do license and reservation fees pay for? Hennelly: The reservation application money all goes back to the (California) Department of Fish and Wildlife and is an important part of their budget. Annually I think it generates over a million dollars for the department. If you want to hunt waterfowl in the state you have to buy a hunting license for $50, and you also have to buy a state and federal duck stamp. All of this money is used for conservation purposes and the management of waterfowl and wetland resources. Also, whenever you buy sporting arms or ammunition for hunting purposes there’s an 11 percent excise tax placed on the sale through the federal Pittman and Robertson Act. This source of funds has been critical to wildlife conservation throughout the United States. Since it was started back in the mid-1930s it has generated over $4 billion dollars for conservation. In California, these revenues are particularly used on our state wildlife areas for wetland purposes, so it will have a negative impact on the Department of Fish and Wildlife’s ability to maintain those lands. Water Deeply: How does your partnership with the California Department of Fish and Wildlife work with regard to access to hunting lands? Hennelly: In terms of providing hunting access, they (the California Department of Fish and Wildlife) have a number of areas up and down the state. Typically the waterfowl areas are referred to as Type A and Type B areas and these are managed wetland habitats that rely on developed supplies of water to provide that habitat. The way the nonprofits like CWA and Ducks Unlimited interact with the department is we do a lot of the habitat maintenance work on those areas. Much of the work that goes into either constructing those wetlands or maintaining them is actually done by the nonprofits. The department has to be able to pay the nonprofits to do that work and if the department has a reduced budget that’s going to make it harder for them to maintain those lands. Water Deeply: What other partners do you work with on conservation? Hennelly: The Nature Conservancy, Ducks Unlimited and a number of other conservation groups are all part of what’s called the Central Valley Joint Venture, which is a public-private partnership with the Department of Fish and Wildlife, U.S. Fish and Wildlife Service and a number of state and federal agencies to try to conserve waterfowl and wetland resources in California’s Central Valley. We try to work as a group to address wetland loss within the Central Valley, but also as part of that provide recreational opportunities, including hunting for the public. That organization has been around, I think, since the early 1990s and has really tried to focus on enhancing and increasing the acreage of wetlands across the Central Valley. Water Deeply: Have you seen waterfowl populations decline or relocate since the drought began? 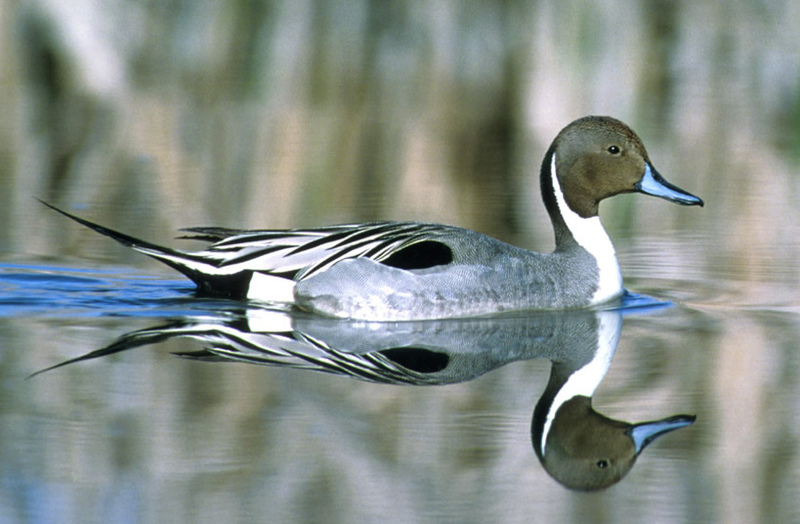 Waterfowl like this northern pintail duck depend to a large degree on flooded rice fields and state and federal wildlife refuges as they migrate across California on the Pacific Flyway. All those categories of habitat have shrunk dramatically because of the drought. Hennelly: Yes, due to the situation up in the Klamath Basin. The refuges up there, they are last in line to receive water. In a typical water year, water has to go to endangered species, then the tribes get their cut of water, then agriculture gets its cut. The refuges are last in line. Unfortunately, there hasn’t been enough water to go around in recent years and because of that we are seeing fewer waterfowl using that basin for spring and fall migration. Also, they are staying for a lot shorter period. Instead of staying for several weeks or even months up in that area, they may now stay for only one or two weeks. It’s really having a very long-term impact to the flyway. The Klamath Basin historically is the most important staging area within the entire Pacific Flyway. Unfortunately, because of the water situation, we’re seeing waterfowl change their patterns in where they stage and fly to because that basin has been so negatively impacted. In the fall, a lot of waterfowl that would’ve been staging in the Klamath Basin, now they’re heading straight into the Central Valley and bypassing the Klamath altogether. That’s definitely a negative impact given that we have only so many food resources (in the Central Valley) and we may run out of food for them. The bigger concern is when those birds leave in the spring they are supposed to end up back in the Klamath Basin to stage before going to Canada or Alaska to breed, but they are bypassing the area. We fear there may be a long-term impact on waterfowl populations because they don’t have the resources once they get to their northern breeding grounds to breed successfully. Without food resources, they don’t have the energy to migrate or to successfully breed and rear their young. Water Deeply: How can agricultural practices assist waterfowl populations without affecting productivity? Hennelly: We have a close relationship with rice farmers in the valley. A lot of the water that is used by rice farmers is also shared with neighboring wetland properties and so there’s a symbiotic relationship there. Flooding their property post-harvest is the biggest thing they do to help. There’s a lot of spent grain after you harvest a rice field that’s still out on the field. When that’s flooded up, it provides great food resources for migrating waterfowl, along with the invertebrates that are in the standing water. They provide the protein source for the birds late in the season. The other main benefit is that when the rice fields are initially flooded in late spring, that’s also the time waterfowl are nesting out on the landscape and that flooded habitat provides very good brood water for the young ducklings. Later in the season, say in the middle of summer, that water is still out on the landscape when waterfowl are molting. All waterfowl have to molt once a year, where they’re flightless for a few weeks at a time and it provides really good molting habitat for the adult birds. What the rice farmers have done has been very critical to ensuring good waterfowl populations within the Central Valley. Water Deeply: What is the rice planting outlook for next year? Hennelly: We won’t know what that is until we get the water allocations from the Bureau of Reclamation and DWR (California Department of Water Resources) later, after January first. They’ll give updates all the way up through April and the rice farmers have to decide if they have enough water and what the price of rice is and how much rice they’ll cultivate. This year, with the drought, I can tell you there’s a lot less rice that was planted on the ground and the last I heard for this fall there’s going to be less than 100,000 acres flooded after harvest. Typically we’ll have as much as 250,000 acres, so that’s a big hit for the birds in terms of the amount of food resources they are going to have available. The other side note is, with less flooded local agricultural habitat as well as fewer wetlands flooded up, it’s going to really increase the risk of waterfowl disease. There are a couple of waterfowl diseases – avian cholera and avian botulism – that are typically exacerbated when you have reduced wetland conditions. There’s a threat here that if we don’t get a lot of rain during the season we could have an outbreak around January. When you have these outbreaks, it kills many waterfowl very quickly. Past outbreaks have killed literally tens of thousands of birds within a couple of weeks. Water Deeply: With such heavy competition for water, does your group find itself competing or at odds with certain organizations? Hennelly: Historically there was a fish versus waterfowl debate that was going on. We tried to get away from that and partner with a lot of the fish groups to find win-win scenarios. One of those right now is a pilot project going on in the southern Sacramento Valley rice fields. They flood up in the winter and act like a natural floodplain. The rice fields, they’re not only great for waterfowl in terms of food, they are also great for fish. What they found is the salmon smolts (juveniles) in these flooded fields are much larger and healthier than they would have been if they had stayed in the river system. We get them back into the river system in much better shape and we hopefully have reduced mortality.